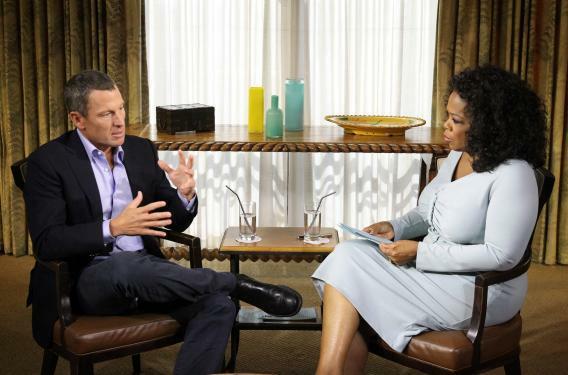 Oprah Winfrey speaks with Lance Armstrong during an interview regarding the controversy surrounding his cycling career on Monday in Austin, Texas. Lance Armstrong called himself a bunch of things last night—“jerk,” “humanitarian,” and “not the most believable guy in the world.” But the word that stuck was bully. Is it the right one for a guy who, as my colleague William Saletan details, allegedly railroaded teammates who refused to dope, ruined people who told the truth about Armstrong’s doping, and sued so many people that by his own admission he can’t remember their names? Yes, bully is fitting enough. But it’s also nowhere near a complete description. When you match it up against Armstrong’s sorry record, it looks more like one more dodge than a confession. After all, admitting you’re a bully doesn’t expose you to legal liability. It’s a lot safer than defrauder and perjurer. For a kid, there’s plenty of exposure in being labeled a bully. For a man with Armstrong who abused his power in ways that did or could ruin other people’s lives, it’s a cop out. For children in school, the standard definition of a bully is someone who verbally or physically abuses a target over whom he or she has more power, repeatedly and over time. Import that to Lance Land, and, yes, you’ve got a bully. But in his interview, Lance wanted to own the word without any of the consequences. “Yes, I was a bully. I was a bully in the sense that I tried to control the narrative and if I didn’t like what someone said I turned on them,” he told Oprah. But when she asked if he threatened to kick cyclist Christian Vande Velde off the team when he wouldn’t get with the doping program, Armstrong denied it. Similarly, he admitted he was the kind of person who always goes on the attack. But then he said he’d only become a bully after going back to his cycling career, post-cancer. Hard to imagine that he has grappled much with this side of his character, much less come to regret it, if he can’t get his timeline straight. Armstrong seemed to be exposing himself the most when he confessed to bullying Emma O’Reilly, the former massage therapist who tried to expose Armstrong’s doping in 2003. “We ran over her, we bullied her,” he said. But then when Oprah asked if he’d sued O’Reilly, he couldn’t remember even the basic details—who he’d sued, for example. His admissions stopped exactly at the point when it turned from a character trait to real adult, legal action, which caused actual measurable harm in another person’s life. Yes, sure, we agree with Lance Armstrong he was a bully. As team leader and megastar cyclist, he had far more power than the people around him, and he used it to make their lives miserable when they did things he didn’t like, especially exposing the cheating and lying that allowed him to build his own myth and stay on top. But bullying hardly covers it. More like, “he assaulted people with intent to absolutely destroy,” as a Twitter user named Brian G. Fay wrote to me last night.